Turkey has lifted a state of emergency at 1 a.m. local time on Thursday (22:00 GMT Wednesday) that has been in place for two years since the 2016 failed coup, Anadolu news agency reported. Turkish president's press secretary Ibrahim Kalin announced the decision last week but warned that it could be reintroduced if a new terrorist threat arose. "The fight against terrorism will be resolutely continued and if there is a threat that will require the introduction of a state of emergency, it will be done again," Kalin said. The state of emergency was initially declared in Turkey after the failed coup attempt of July 2016, and has been repeatedly prolonged since then. On July 15, 2016, a military takeover attempt took place in Turkey, leaving over 240 people killed. Following the unrest, over 50,000 people were arrested, and more than 160,000 government officials and military officers were dismissed or suspended. Ankara accused Islamic cleric Fethullah Gulen, who has been living in the United States since 1999, and his followers of orchestrating the attempt. Gulen has refuted the allegations. Last week, the Court of Istanbul sentenced 72 military personnel, convicted of plotting the failed coup of July 2016, to life in prison. According to the NTV broadcaster, the troops were found guilty of taking control of the Bosphorus Bridge as part of the activities aimed to overthrow the government two years ago. After the failed coup, the government amended the country's constitution to vest more powers in the head of state. 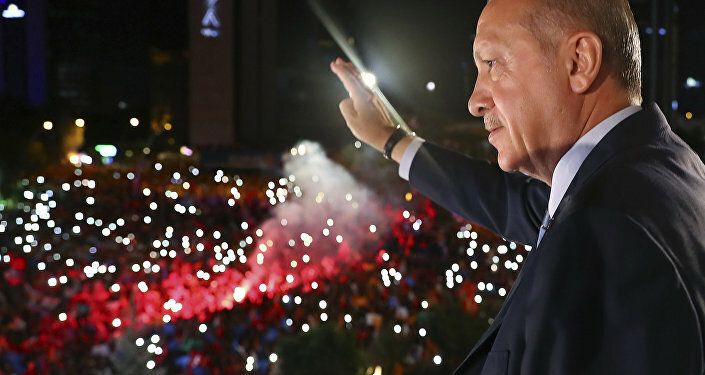 Turkish President Recep Tayyip Erdogan, who was re-elected earlier in June, now has the right to appoint top public officials, the government, and vice-presidents; has a say in the country's legal system; and can impose a state of emergency. The Turkish opposition has repeatedly criticized the prolongation of the state of emergency saying that it threatens human rights and freedoms in the county. The extension of the state of emergency has also become one of the cornerstones in Ankara’s relations with the European Union, which has repeatedly called on Turkey to lift its state of emergency.